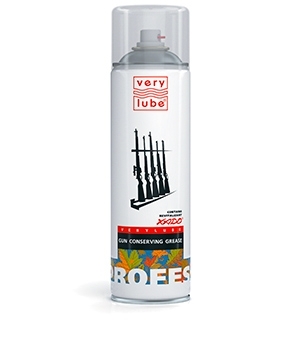 Gun spray grease for conserving, cleaning and lubricating the arms before storage. Contains revitalizant. It provides a reliable protection of the arms against corrosion even if stored outdoors for a long time. It is used for small-bore and large-caliber rifled and smoothbore arms of all types (hunting, sporting, fighting and pneumatic). It is used to take care of the arms after shooting and prepare them for storage. Quickly helps to prepare the arms for storage. Possesses high penetrating abilities and gets to all parts of the arms. Special inhibiting components of the grease neutralize aggressive actions of the scale particles left after cleaning. Possesses perfect low-temperature properties, provides mobility and smoothness of the mechanism operation at the ambient temperature up to -60 °С. Owing to revitalizant, it keeps the surface of the barrel bore in top condition. 2. Spray a thin layer onto the work surface (part, joint). 3. If necessary, wipe with a napkin. 4. If heavily contaminated, repeat the treatment.